Peter Long on Chess: National Team Selection - On Merit and Without Fear or Favour! National Team Selection - On Merit and Without Fear or Favour! 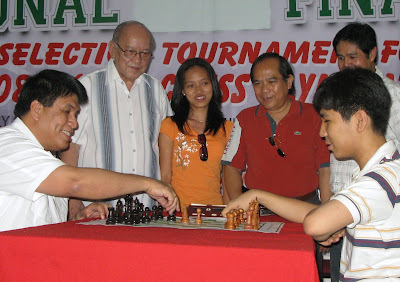 With the start of the National Chess Championship Finals today and which will be held in Manila from 1-13 July 2008, the National Chess Federation of the Philippines (NCFP) is at the final stage of a 4 month long Olympiad team selection process that saw 1,500 players participate in 16 regional qualifiers! The qualifiers, together with titled players, 150 in total advanced to the Semi-Finals where 12 men and 6 women made it to the finals where they were joined by the top 6 men and women on the FIDE rating list. NCFP President Prospero Pichay who inaugurated the event in a short opening ceremony announced that this event would, as published earlier, be the basis of qualification for both the 38th World Chess Olympiad 2008 and the World Mind Sports Games held a month earlier in Beijing. He also reminded the players present that it was indeed a honour and privilege to represent your country at such prestigious events and noted that GM Mark Paragua and GM Darwin Laylo had even returned from playing in the USA to try and qualify. The men finalists are: GM Wesley So, GM Mark Paragua, GM Jayson Gonzales, IM John Paul Gomez, IM Julio Catalino Sadorra, GM Darvin Laylo, GM Buenaventura Villamayor, IM Ronald Bancod, IM Chito Garma, Jerry Nodado, IM Barlo Nadera, Jony Habla, Noel Dela Cruz, Edmundo Gatus, Leonardo Carlos, Haridas Pascua, IM Richard Bitoon, and IM Rolando Nolte. Notable absentees were veteran GM Eugenio Torre and his long time rival GM Joey Antonio. And the women finalists are: Catherine Perena, Shercila Cua, Enerose Magno, Sherily Cua, Chardine Cheradee Camacho, Kimberley Jane Cunanan, Daisy Rivera, Christy Lamiel Bernales, WIM Cristine Rose Mariano, Rida Jane Young, and Eden Tumbos. Sheerie Joy Lomibao missed the start of play. Yes on merit and without fear or favour but an RP team that would finish not better than 25th place. Are we going to be in Dresden just for the sake of competing? Is giving an equal chance to everyone more important than being more competitive? With Torre and Antonio braking into the top ten is a great possibility and we are a force to be reckon with but without these two gentlemen you take away that chance. Pichay has been making great moves lately untill this great blunder of his. He took away the chance of Phillipines to finished in the top ten under his tenure. Torre and Antonio should have been seeded in the tournament! The Second Half of 2008 is Full Indeed!